Get the Turbine’s Real Power and Increase Engine Torque! 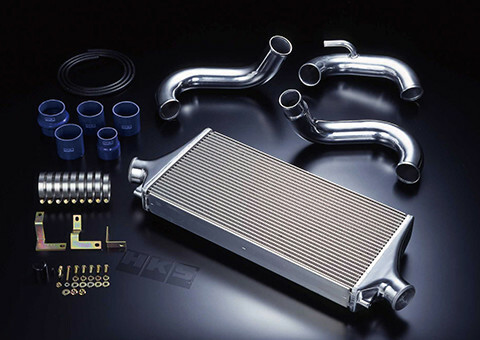 All HKS Intercoolers improve both the efficiency and power of any turbocharged application by rapidly reducing inherent heat levels of the compressed intake air charge before entering the engine. 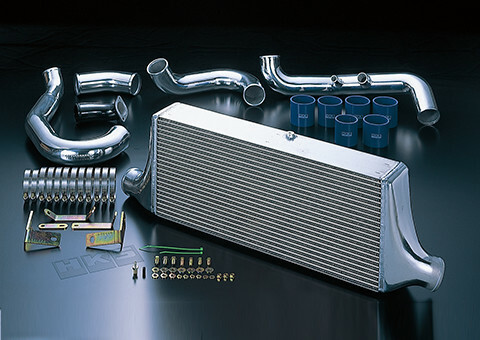 By utilizing a special tube and fin design, the intercooler acts as a large heat exchanger that dissipates the heat generated by the compression of the intake charge without creating reductions in boost pressure or response. 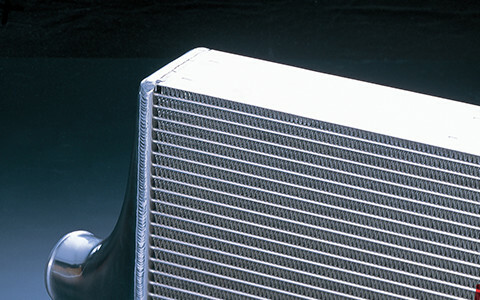 The cooling efficiency of an intercooler is affected by many factors including the frontal surface area of the core, cooling fin design and air flow through and over the core. HKS has increased the size of the core over stock to increase the air flow over the core. New type cooling fin now offers improved heat radiation. Core end tanks have been designed to flow the compressed air evenly across the whole intercooler core. All these factors will maximize reduction of intake air temperature which increases air density. Increasing the range of fueling and ignition setting making it possible to deliver more power and torque. 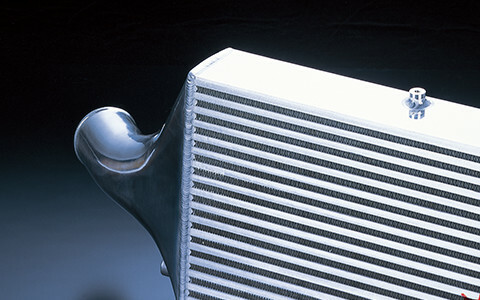 In pursuing intercooler performance, reducing pressure loss becomes just as important as cooling efficiency. If the pressure drop is significantly high, throttle response and the torque is reduced. However, pressure drop and cooling efficiency are conflicting properties. By reducing pressure drop, cooling efficiency also suffers. A large cause of pressure drop is the cross sectional area of the tubes in which the air flows and inner fin layout and shape. HKS has emphasized cooling efficiency yet achieved a low resistance design with thin fins. Tube design has been also considered in many possiblities and increasing the cross sectional area. With these measures in place, high levels of cooling efficiency have been achieved without sacrificing pressure drop. S TYPE is designed for street use; ideal for stock vehicles, lightly tuned vehicles, and for vehicles with stock replacement type turbines. The engine response under street driving and performance at a mid to high speed range are well-balanced. * S Type AL is aluminum polished piping type. ・Short type that the pitch is optimized for fin shape, for small and light to improve the cooling efficiency. ・Triangular straight type for less pressure loss of air flow. ・Cooling efficiency improved with louver because of the shorter length and angle of the fin. ・Wide surface of louver make it more efficient in cooling. R TYPE is designed for circuit use; ideal to use with a stock replacement type turbine to wastegate type large size turbine. This intercooler derives better turbine performance regardless the engine rpm during driving on a straight track and acceleration after cornering. The weight is approximately 25% lighter than a conventional product. (In-house comparison). * R Type AL is aluminum polished piping type. Triangular straight type for less pressure loss of air flow. Like S TYPE, Triangular louver type for outer fin.